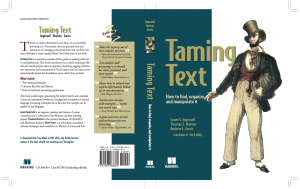 It’s been a long time coming, but Taming Text is now at the printers and is available to pre-order from Manning or Amazon. The eBook will be available shortly and the pBook not too far behind. Also note, all of the book examples are available via Github under an Apache license.